Proanthocyanidins (also called leukoanthocyanidins) are a class of natural polyphenolic bioflavonoids that are very widespread in nature. Proanthocyanidins appear to be especially effective in neutralizing highly reactive hydroxyl and singlet oxygen radicals. Both of these reactive oxygen species are involved in inflammatory processes. Proanthocyanidins also support and enhance the activity of vitamin C, and are known for their ability to help support the health of the body's capillary system and connective tissues. Proanthocyanidins have been shown to bind with collagen fibers, thereby protecting them from premature degradation. This helps maintain the natural elasticity of collagen in skin, joints, arteries, capillaries, and other connective tissues. This supplement helps support cardiac health by maintaining youthful endothelial function, regulating platelet aggregation, and reducing inflammation. It is a powerful protector of heart and general circulation. It favorably changes a number of metabolic signals toward reduced risk for cardiovascular disease. It is proven to act as a water-soluble antioxidant and helps lower key inflammatory signals such as CRP, IL6, and TNFa. It is also proven to act at the gene transcription level, helping clear cholesterol, reduce triglycerides, and directly helping the key inflammatory gene signal known as NF-kappaB. Chronic Venous Insufficiency: Proanthocyanidins have been shown to strengthen capillaries in double- blind research. Capillary Fragility: Proanthocyanidins extracted from grape seeds have been shown to increase capillary strength in people with hypertension and diabetes. Retinopathy: Found in pine bark, grape seed, and other plant sources, proanthocyanidins may help slow the progression of diabetic retinopathy. Sunburn: These flavonoids may increase the amount of ultraviolet rays necessary to cause sunburn. Hypertension: grape seed extract may lower blood pressure in people with mildly elevated blood pressure. 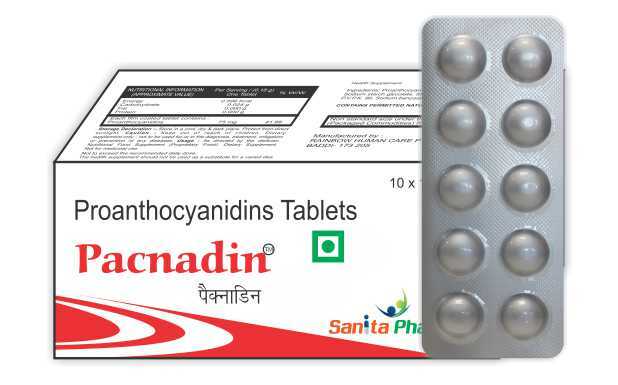 Proanthocyanidin is an industrial derivative of grape seeds, extremely rich in antioxidants and oligomeric proanthocyanidin complexes (OPCs). The extract has been linked to a wide range of possible therapeutic properties including healing wounds and treating conditions such as high cholesterol, atherosclerosis, macular degeneration, poor circulation and nerve damage. Proanthocyanidins are highly regarded for their strong antioxidant properties, and for their functions in supporting the body's connective tissues and capillary blood vessel system. The product is POSSIBLY SAFE for most adults when taken by mouth. There is no disadvantage associated with the product. if taken under the recommended usage. Pregnancy and Breast-Feeding: Pregnant and lactating mothers should not take any single supplement in higher-than-normal doses unless recommended by a health-care provider for a special condition. The combination should only be used in pregnancy and lactation if benefits outweigh the risks. Stay on the safe side and avoid use.